I love the simplicity of this Clean and Lean Salad and the refreshing taste. The juicy vegetables gives this salad such great crunch. The best part is–it makes you feel good about eating something good for you! If you need some protein or want to make it a meal, add pan-fried tofu or grilled chicken. 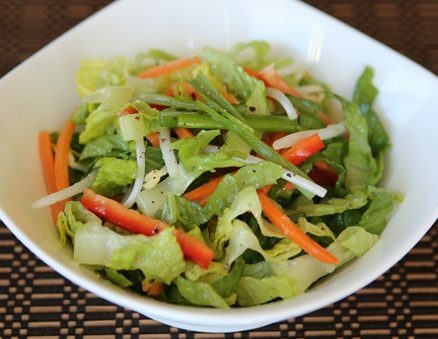 Try this delicious salad with the Honey Lemongrass Dressing. Yum! Chop romaine into thin strips. Cut off the tops (green part) of the green onions. Cut into 1 inch long sections and then into thin strips. Add the romaine, green onions, carrots, red bell peppers and bean sprouts into a large mixing bowl and toss together. Sprinkle with freshly ground black pepper and serve with the Honey Lemongrass Dressing.